"We're not evil, we just play bad people on TV"
I will be honest and say that aside from the season finale, I had never watched an episode of the hit show Survivor. For some reason it just never appealed to me. I mean if I wanted to see backstabbing, dishonest people being nasty to each other, why would I watch it on TV? I can live it with my friends and at work. But no matter how hard I tried, I couldn't get away from Survivor. Every time I would turn on the radio, open a magazine or even read a newspaper there it was. Survivor is truly a pop culture phenomenon, and like most pop culture giants, it isn't going away anytime soon. Not unlike The Real World, Survivor shows us the lives of ordinary Americans under a microscope. Only it just so happens that these sixteen average Americans were sequestered on the deserted island of Pulau Tiga for 39 days. For their stay, they must learn to live as a tribe, although eventually it becomes more of a personal struggle for each than a group challenge. As they compete in challenges for "luxuries" (a barbecue, a phone call home, etc.) and immunity every three days, the losers of these challenges must face tribal council, where they will account for their actions by voting one person off of the island. At the end of Day 39, there will be only one survivor left who will leave the island with one million dollars. When Andy Warhol put forth his great proclamation that in the future everyone would have his or her fifteen minutes of fame, I think he knew something about Survivor. Since the last episode in August of 2000, the cast members have been everywhere, it seems. From guest stints on Regis and Kathie Lee to roles in such high quality film projects as the latest Rob Schneider blockbuster. Please Rob, we kid because we love. Even the winner of the show, Richard Hatch (also known as "the naked guy") is developing his own game show and claims to have "other projects in the works". 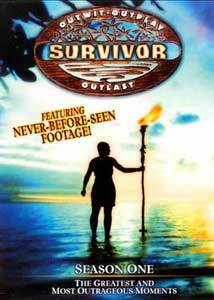 But in the end Survivor is entertaining, as this new DVD from Paramount proves. Featuring highlights from season one as well as never before seen footage and interviews with the contestants, there is enough here in this over two-hour disc to delight even the casual viewer. Sure, Survivor is a guilty pleasure in the truest sense of the phrase. The people eat rats, wear no makeup, and they are festooned with scabs and bug bites. And I wouldn't doubt that if the people got together for a postcard photo it might read "Bring out your dead". So I suppose that leaves me with only one question: When does the second season start? Image Transfer Review: Presented in a full-frame transfer, this disc looks better than I could have imagined. Sharpness and detail are done well, and the many nighttime scenes come off looking great, with no grain at all. Colors are vibrant and come across very well with the blues of the water and the greens of the trees looking consistently perfect. If there is a flaw with the transfer it is that it suffers from being too soft, like most television DVDs. Overall this transfer surprised me greatly. Audio Transfer Review: While I was expecting this track to be a bit flat I was surprised to see that it was in fact in Dolby Digital 5.1. And the kicker is that it sounds very, very good. Music and ambient noise fill the room and dialogue is clear from the center channel. While not an active track, it gets the job done and kudos to Paramount for releasing the 5.1 track as opposed to the broadcast Pro Logic mix. Extras Review: While not known for special edition discs, Paramount has created a nice mix of extras for the DVD of Survivor. First is a very informative twenty-minute documentary on the phenomenon that is Survivor. Series creator Mark Burnett and host Jeff Probst share their thoughts on the show and talk a bit about the difficulty of filming and how the crew had to react to some of the challenges they faced. Perhaps the best extra feature is the Cast Profile section. With everything from a video of their last words on the set to their favorite moments from the season and more, this is sure to please every Survivor fan. Maps of the island as well as a group of episode summaries round out the extras on this disc. While I have a problem with Survivor getting its own DVD from Paramount when other classics from the studio are nowhere to be seen. This is a nice disc for the fans of the show and the MSRP of fifteen dollars is nice. Plus, who wouldn't want to look back in fifteen years and see this disc as a sign of how low television can really go. Recommended.